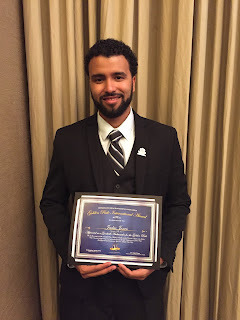 November 2015 on Capitol Hill in Washington DC, Jadee Jones received the Golden Rule International Award - World Peace Ambassador for living a life that exemplifies the motto of the Golden Rule International, “Treat others the way you want to be treated.” Jadee has exemplified the Golden Rule through his dedicated lifestyle of imputing into many young lives. As an athlete himself he has done this through sports programs that are teaching athletic skills and providing a safe positive environment for kids. He knows the value of this environment for good character growth of young people. Jones also actively works as a Cultural Advocate bridging the gap between minority families and the school system. He supervises in the classroom, consults and meets with students and parents as well as monitors their grades and achievements. He actively puts his life into the belief system that every life is valuable and is created for a contribution to our world. Ambassador Clyde Rivers is also the Representative for the Golden Rule International and the Interfaith Peace-Building Initiative, North American Division to the United Nations – New York. Interfaith Peace-Building Initiative is affiliated with the Department of Public Record (DPI) – United Nations as well as affiliated with the United Religious Initiative (URI), an Interfaith Peace organization. The Golden Rule International Award is now established in 120 nations of the world. This organization seeks out top achievers that live the Golden Rule in their everyday life. This is a new global ethic that the leadership of the Golden Rule International Award, Patron, former President of Ethiopia, Girma Wolde and Ambassador Mussie Hailu have embraced and are promoting globally.